Nous avons récemment énuméré notre maison de ville de vacances spacieuse de 1650 pieds carrés Puamana. Contrairement à un condo, il n'y a personne vivant au-dessus ou au-dessous de vous, donc votre tranquillité est assurée. Il dispose de 3 chambres entièrement fermées: Une chambre niveau principal avec lit queen size, TV, et véranda privée, une suite parentale au deuxième niveau avec lit queen size, TV, salle de bain privée et véranda, et une autre chambre de second niveau avec queen size lit. Toutes les chambres ont des ventilateurs de circulation d'air qui est tout ce qui est nécessaire sur la rive nord pour vous garder au frais et confortable avec nos alizés caressants. Il y a aussi un matelas d'air rehaussé haut de gamme disponible pour prolonger les arrangements de sommeil pour jusqu'à huit invités. Notre salon est spacieux et confortable avec une télévision à écran plat de 42 pouces, et une grande véranda privée et un barbecue à gaz. La salle à manger a une table en verre avec des sièges pour six à côté de notre cuisine équipée avec des appareils haut de gamme et des ustensiles de cuisine. Nous avons beaucoup plus de photos de notre maison de ville et les terrains de Puamana nous serions heureux de vous envoyer si e-mail ou appelez-nous. Les informations de contact apparaissent sur le côté droit de cette page du site Web. We had a great time on our vacation. This rental met our needs in every way. We would highly recommend! Thank you Karl! "Great Princeville Condo, extremely good value"
The condo has a great location in the north shore of Kauai. The Hanalei area and beach were great. Spent several days playing family friendly volleyball on the beach there since this beach had 2 volleyball courts. 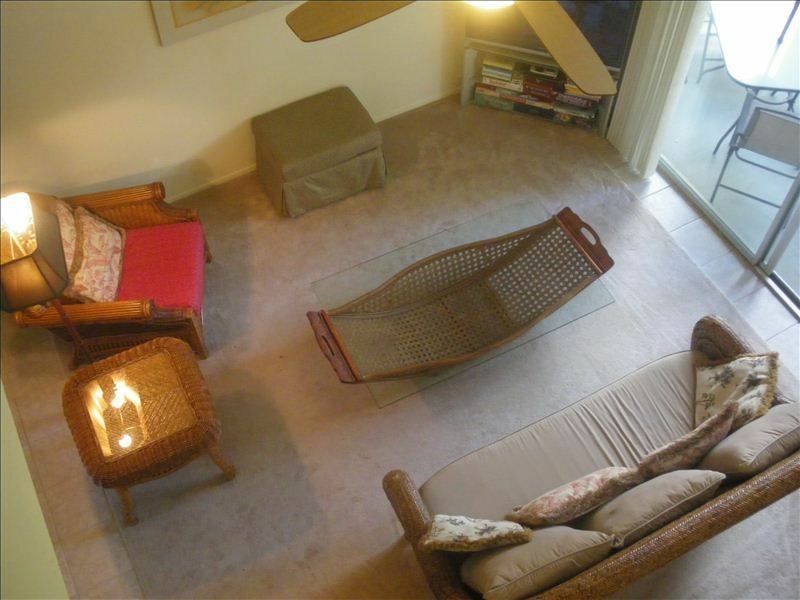 The condo also provided beach accessories (chairs, boards, etc.) which we used while at the beach. The 3 bedroom and 2 bath condo was great for our family of 5 even though it seems to be an older one but we did not mind that since the space made up for it. Condo also had everything you would need for your stay plus lots more. A few days while in Kauai were hot and humid so air conditioning would have been nice but we use the ceiling fans while in the condo which helped a great deal and knew when we booked it that it did not have it. Karl was always helpful during the booking process and after. Answered all our questions we had. Did not need anything from him while we were there as we did not really encounter any real issues. The only down side to our stay was definitely the parking. We would be out all day sightseeing or shopping and would come back and all of the parking spaces were filled where we were to park and had to park two buildings down from ours. This was an issue since we had my mother in law with us who does not walk well but would drop her off at our building so she did not have to walk from where we had to park most of the time. Would have been nice to get a closer spot where we were suppose to park and not sure if the owner can control the parking and this is why I gave 4 stars instead of 5. But overall this place was great and we had a wonderful time at the condo and Kauai. Aloha Michelle and thank you for taking the time to write such a detailed review. Concerning the parking issue you mentioned, it's unfortunate that you didn't contact me the first time you returned to the townhouse and found all four of the #19 parking spaces occupied. That shouldn't have happened as there are four townhouse units in building #19 and and four #19 parking spaces. Each of those four townhouse units is allowed only ONE of those four spaces which means someone was parked there that was not authorized to do so. Had I known about it, I would have alerted the on-site manager to the problem and he would have been corrected it for the remainder of your stay. That being said, I am so glad you otherwise enjoyed your stay and I hope you will consider staying with us again the next time you travel plans include Kauai. Nice place to stay yo cover your basic traveling needs. This condo was a good value and easy to use. The host responded well to my questions via email. Without solicitation, he was extremely helpful when a hurricane was threatening Kauai. He told us what storm preparations to make and the location of the storm shelters. We were looking for a basic condo in good shape with adequate kitchen equipment in a beautiful setting. This condo fulfilled that perfectly. We loved the convenient and beautiful location in Princeville next to the Westin resort, which is beautiful to walk past at dusk with its tiki torches. You can also take a pretty 10 minute walk down to Wyllie Beach from the condo. We appreciated the kitchen appliances (rice cooker, slow cooker, blender--old, but it still worked), the washer and dryer, the patio grill, beach towels, an extra inflatable mattress, and convenient small items like paper and pens, games, spices, and an umbrella. The only thing we would have liked in addition would be air conditioning on hot, humid afternoons, but then the condo would be more expensive, so we were happy with it the way it is. The three bedroom condo suited us perfectly. Two bathrooms made it easy for the six of us. The condo is an older one but the room it has to offer is great. The washing machine and dryer was good. Roomy kitchen and dining room have plenty of room for larger family groups. We are a stones throw from Hanalei Bay and only a 30 minute drive to Kapaa. If wanting to shop at the bigger stores in Lihue, plan to make a day of it. Plenty to see and do from our base here. Would definitely recommend to those wishing to stay. The place was fully equiped but it was not washed deeply ... dust everywhere and the top of the fans was discusting 😱 mold on the wall... the carpet was old. This place need a serious makeover.